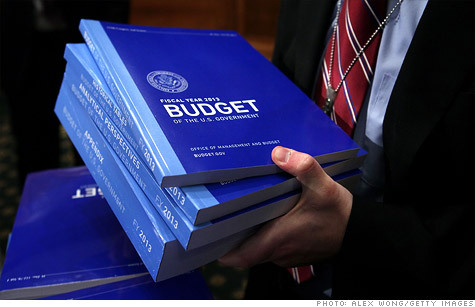 NEW YORK (CNNMoney) -- President Obama unveiled a $3.8 trillion budget request Monday that hikes taxes on the rich, spends new money on infrastructure and education, but does little to reform the entitlement programs that pose the biggest long-term threat to the federal budget. "We built this budget around the idea that our country has always done best when everyone gets a fair shot, everyone does their fair share and everyone plays by the same rules," Obama said in his budget message. But the budget forecasts a deficit for fiscal year 2012 that will top $1.3 trillion, before falling in 2013 to $901 billion, or 5.5% of gross domestic product. The deficit projections, which have hovered near $1 trillion for each year of the Obama presidency, mean that Obama will not satisfy his 2009 promise to halve the deficit by the end of his first term. White House officials described the budget as a continuation of two major speeches given recently by the president -- one in Kansas where he promised Americans a "fair shot," and last month's State of the Union. The budget also offers fresh insight into how the White House plans to comply with last year's Budget Control Act, which allowed Congress to raise the debt ceiling in exchange for caps on discretionary spending accounts. Many of the high profile recommendations made in the budget were first floated by the administration last year as part of a deficit reduction plan rolled out in September. Spending: The administration is proposing a series of investments focused on infrastructure, education and domestic manufacturing, including old favorites like $30 billion to modernize schools and an additional $30 billion to retain and hire teachers and first responders. One key element of that plan is a six-year proposal to spend $476 billion on surface transportation, a big increase from current levels, and much more than other proposals lawmakers are considering. At the same time, the White House had to comply with the spending caps enshrined in the Budget Control Act, which total in the neighborhood of $1 trillion in discretionary spending over a decade. That means many programs will see their funding cut. "Every department will feel the impact of these reductions as they cut programs or tighten their belts to free up more resources for areas critical to economic growth," Obama wrote. Discretionary spending is projected to fall from 8.7% of GDP in 2011 to 5.0% in 2022. The budget details 210 places where programs will be cut or eliminated, for savings of $24 billion in 2013 and $520 billion over a decade. For example, the budget eliminates an Air Force satellite system that is "no longer needed to meet mission requirements." And the budget proposes consolidating the Bureau of Public Debt and the Treasury's Financial Management Service. The president would also like to cut some mandatory spending, including select farm subsidies and federal employee retirement and health benefits, for savings of $217 billion over a decade. Military spending will be reduced. The Pentagon plans to spend $487 billion less over 10 years, a course that Secretary of Defense Leon Panetta has already laid out in some detail. But even with some cuts, annual deficits are still projected to be more than $500 billion every year for the next decade, and the budget would add $7 trillion to the debt held by the public between 2013 and 2022. Taxes: The budget proposes a tax hike of $1.5 trillion, which includes a provision that will allow the Bush tax cuts to expire for high-income earners, a long-held Obama position. Obama would like carried interest to be taxed as ordinary income, which means money managers would pay more than double the rate they currently pay on a portion of their compensation. The budget also incorporates the Buffett Rule, a guideline to ensure that the wealthiest do not pay a lower overall tax rate than those who earn substantially less money. Specifically, no household making more than $1 million will be a allowed to pay less than 30% of its income in taxes. It also calls for a year-long extension of the payroll tax cut and unemployment insurance. In addition, the White House wants to reform the individual tax code in a way that "eliminates inefficient and unfair tax breaks for millionaires while making all tax breaks at least as good for the middle class as for the wealthy." On corporate taxes, details are scarce, but administration officials said that the president will unveil a plan to reform the corporate tax code later this month. Entitlements: Because the president's budget does little to address how to curb the growth in entitlement spending, it's unlikely to stabilize deficits beyond the next 10 years. The budget would cut more than $360 billion from Medicare, Medicaid and other health programs over a decade. But that's a drop in the bucket when compared to the rapid expansion of costs expected for entitlement programs. "While [Obama's] budget stabilizes debt over the next decade, the real problem arrives thereafter, as entitlement costs spiral out of control and revenues are inadequate to deal with a wave of retiring baby boomers," Pete Domenici and Alice Rivlin, who led their own debt task force, said in a joint statement. Of course, proposing significant cuts to Medicare and Social Security during an election year is a politically risky move, but by not saying much on the issue, the White House opened itself to criticism. House Appropriations Committee Chairman Hal Rogers took Obama to task on Monday, saying the proposal "falls exceptionally short" on entitlement spending reform. "It is imperative that both the President and Congress put greater focus on addressing the exploding costs of these programs," Rogers said. "Without meaningful action in this area, the nation's debt and deficit crisis will continue, increasing the risk to our nation's financial and economic future." What's next: Obama's budget request is essentially a blueprint of his fiscal priorities -- the programs he would like to fund or cut, the new investments he would make and how he would pay for it all. But the request is just that -- a request. And it's one that Congress can accept, reject or modify. Even if Obama's budget is adopted -- which it won't be -- the estimates for deficit reduction may or may not pan out depending on how close to reality the administration's forecasts for unemployment, interest rates and economic growth prove to be. In any case, Obama's 2013 budget is only the first step in a convoluted process that involves no less than 40 congressional committees, 24 subcommittees, countless hearings and a number of floor votes in the House and Senate. If all goes well, a formal federal budget for government agencies will be in place by Oct. 1, the start of the 2013 fiscal year.